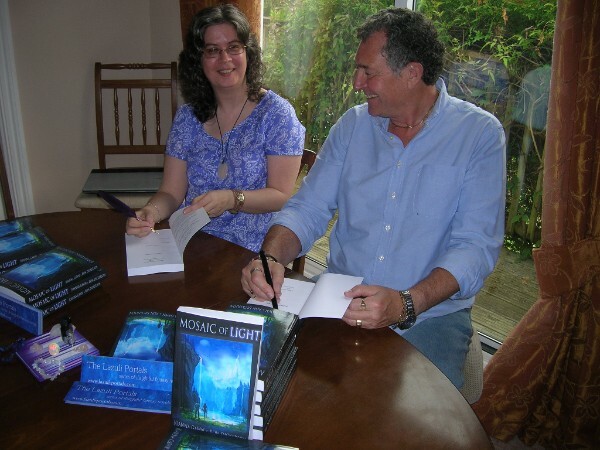 This year, we decided we wanted to write something involving Keira, Jason, and their ‘lovelight’ cat, Spooky, who makes his first appearance in Mosaic of Light, the second book in The Lazuli Portals Trilogy. I held my breath, watching. I stifled a giggle as Spooky batted at the bauble again, his head on one side as though trying to figure out something. I didn’t want to distract him; his focus was so intense! I switched on lovelight, too, and sent a little more streaming toward the Christmas tree. “Spooky!” Jason leapt up from the sofa and lunged for the cat, just as a paw caught in the winding cable of the fairy lights and the tree began to stagger precariously to one side. I muttered something incomprehensible and grabbed for the top tier of the tree to steady it. I thought I saw the gold star at the apex of the tree send out a momentary burst of light. It was so fast, though, I’d probably imagined it. Next Next post: Happy New Year! The House of the Stormwind and Other Short Stories is now FREE in ebook format!